These moist treats are a satisfying snack for all dogs, especially those looking to achieve or maintain a healthier outer appearance. The balanced ratio of Omega-6 and Omega-3 fatty acids plays a vital role in healthy skin, hair coat and immune function. This special formula contains lean, whitefish and salmon meal proteins blended with peas, apples, blueberries, carrots and spinach for high palatability. 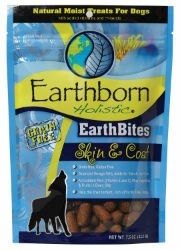 Your dog will enjoy the taste of these nutritious, grain-free treats.